Brief: to deliver a keynote focusing on ways to think creatively about key management issues as identified by staff surveys, and to develop solutions based on facilitated discussion and shared ideas. 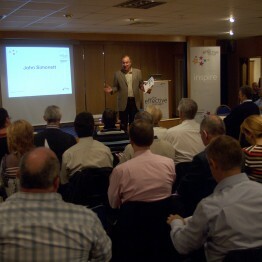 John flew to Glasgow for a pre-event meeting with the conference organisers to devise a programme in keeping with the aims of the event. 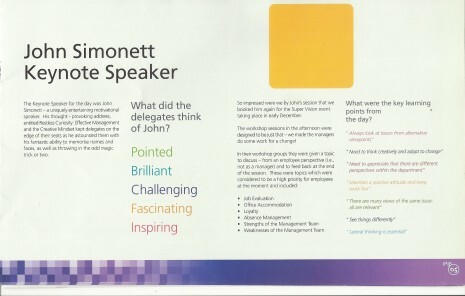 Delegates were asked to sum up John’s contribution in one word – these included “Pointed” “Brilliant” “Challenging” “Fascinating” and “Inspiring”! Footnote: John was kept on his toes after reading this comment from the previous year’s conference …. where in answer to a question asking what type of speaker they would like in future, one delegate had put: “speakers who are relevant, current and practical – with no platitudes and tired clichés, and no corporate mumbo jumbo or flavour of the month management gobbledegook…..”!